1)Music source: 38 different musics for optional, use the external button "music" to finish. Easy, Fast, Wire Free Installation - Infrared sensor detects motion and sends a signal to the receiver. 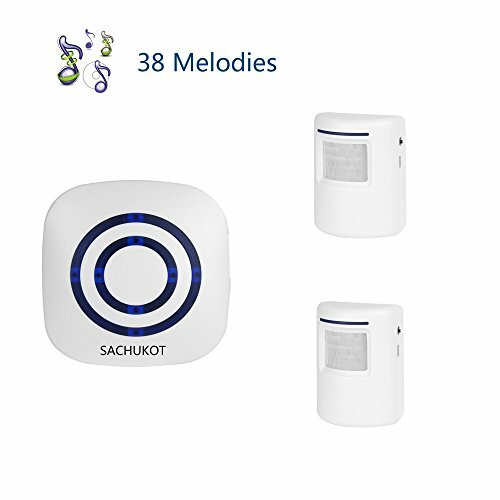 Chose from 38 Ringtones with Bright LED Light. Sensor is wall mountable. There are 2 modes choices (LED Flash/Sound and LED Flash), 6 levels volume ). . . Suitable location - Ideal for front doors, window frames, driveways, walking paths, and anywhere in your home you want to be alerted to motion. Also great to alert business owners that are working in the back, or out of sight, to customers entering their store. Note - Includes 1 plug-in receiver unit and 1 motion sensors requiring 6x AAA batteries (Not Included). If you have any questions about this product by SACHUKOT, contact us by completing and submitting the form below. If you are looking for a specif part number, please include it with your message.